This carte-de-visite is a composite of ten Native American images believed to have been made in the late 1860s and early 1870s by William S. Soule. At least some of the images were likely made in Indian Territory; some may have been made in Kansas. The featured photo in the center is of Satanta, the Kiowa chief. Starting at the top, immediately above Satanta, the remaining images are (moving clockwise): Arapaho camp; two Arapaho girls; Kiowa or Kiowa-Apache man named Asa Tongat; unidentified camp scene; Cheyenne woman; Cheyenne man; unidentified camp scene; Cheyenne or Arapaho woman; and, two unidentified young women. Two of the photos are an exact match of a known Soule image (Satanta and Arapaho camp). Two others have the same subjects as known Soule images, but depict them in a different pose (two Arapaho girls and the Cheyenne or Arapaho woman). Will Soule is well-known for the photographs he made of Southern Plains Indians in the late 1860s and early 1870s. He arrived at Fort Dodge in 1867, moved briefly to Camp Supply a couple of years later, then relocated to Fort Sill, where he remained until returning to Boston in late 1874 or early 1875. The carte-de-visite is one of at least fifty collected by Charles L. Wilson in the 1870s. Born in West Virginia, Wilson lived in Kansas most of his life, residing in St. George, Manhattan, Miltonvale and Topeka. Little is known about how and why he acquired the cartes-de-visite. Notations on many of them suggest they were procured in Indian Territory; some notations also indicate that Wilson was a member of Company L of the Kansas Eleventh Cavalry. Because that regiment disbanded several years before the images were made, his military service was probably unrelated to acquisition of the photos. The Wilson collection is characterized by the unique style in which each carte-de-visite is mounted. The mounts obscure whatever photographer's imprint may exist on the original cards. More than one photographer is represented in the collection; however, many of the images can either definitely be attributed to Will Soule or are deemed likely to be his work. 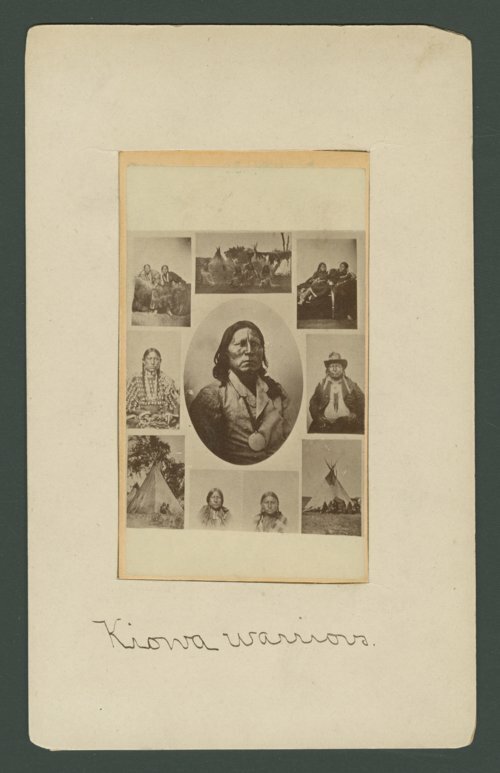 Three of the photographs in the composite are also included in the Wilson collection as individual cartes-de-visite--Asa Tongat (Item 227905), the Cheyenne man (Item 303271), and the Cheyenne woman (Item 303272).